Under Armour is a sports-ware brand at the very top of their field. They provide athletes and sportsmen with technically advanced products that are painstakingly engineered with superior fabric construction, moisture control and proven innovation. 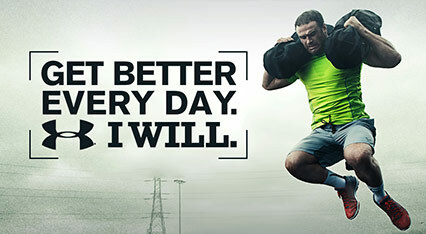 Gain a competitive edge with Under Armour. This exclusive voucher code from Under Armour is proudly presented to all TroopScout users including: our servicemen, ex-forces, family and friends. Click ‘Get Code’ to get the voucher code and open the Under Armour website. Under Armour is the leading designer in performance sportswear. The company was founded in 1996 by a former college athlete with the goal of creating a shirt that worked with your body to regulate body temperature. Under Armour’s staple t-shirt design was made to provide compression and wick perspiration off of your skin, where other shirts would simply absorb it. Since then they have created several lines of performance clothing for athletes and fitness buffs alike including their HeatGear, ColdGear, and AllSeasonGear. Their HeatGear is designed to keep you cool, dry, and light during the hottest days of summer. ColdGear is perfect for any winter sport or that snowy football game, keeping you warm, dry, and light. AllSeasonGear is a great fit for any occasion keeping you dry, light, and comfortable. Under Armour’s clothing does not only perform great in any climate, but it looks great too. They have the perfect clothing, built to last for men, women, and children which will keep you performing at your best in the trendiest sport’s fashion. Under Armour clothing can be found in retailers throughout the U.K. and around the world. In addition to their many great clothing options they have a full line of accessories and shoes including football boots, gloves, bags, and so much more. This Exclusive Under Armour Voucher Code is valid on sales via the official Under Armour webstore. Cannot be combined with other vouchers and on-site promotions. Does not apply on following products: UA Band, UA Headphones Wireless, UA HealthBox, UA Heart Rate Monitor, UA Scale, The Rock. For more detailed terms and fine print please contact the retailer direct.